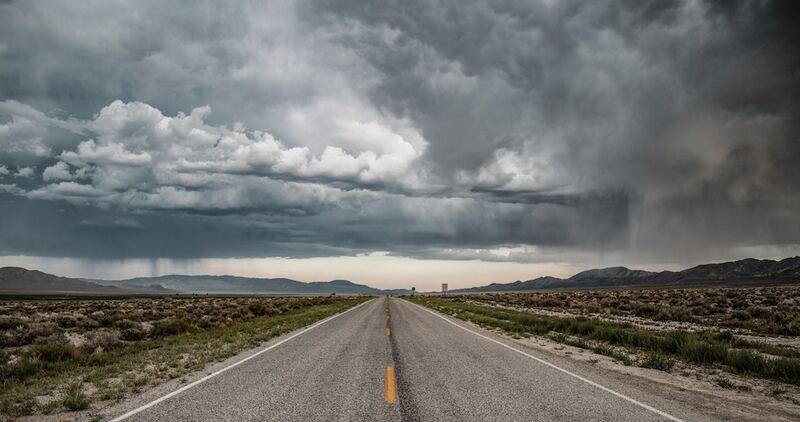 I love road trips, especially through the deserts of the southwest US. I like the unexpected twists and turns, the surprises, the randomness – you never know exactly what’s going to happen. Washed out roads, sand traps, stubborn livestock, rocks, and ruts. I try to prepare for every eventuality, and there is a cost in terms of planning, equipment, weight, and time. But the result is a much smoother ride. The same applies to managing an institutional portfolio: there’s a cost to being prepared but it is worth it. Far from reducing exposure to hedge funds, I believe asset managers should be increasing it. Using a few simple examples I will show you why. Quiz: Which of the following portfolios would you rather have over the long haul? Did you choose Portfolio 2? Portfolio 2 has big dose of alternatives in it. Far more than the most aggressive institutional money manager would contemplate. I will make the case in this article for a large allocation to hedge funds and managed futures. For clarity, when I use the terms “hedge funds”, “managed futures”, “CTAs”, and “alternatives”, I am referring to liquid strategies rather than private equity, venture capital, or real estate. not correlated to the S&P. without the S&P’s tail risk. without the S&P’s drawdown profile. 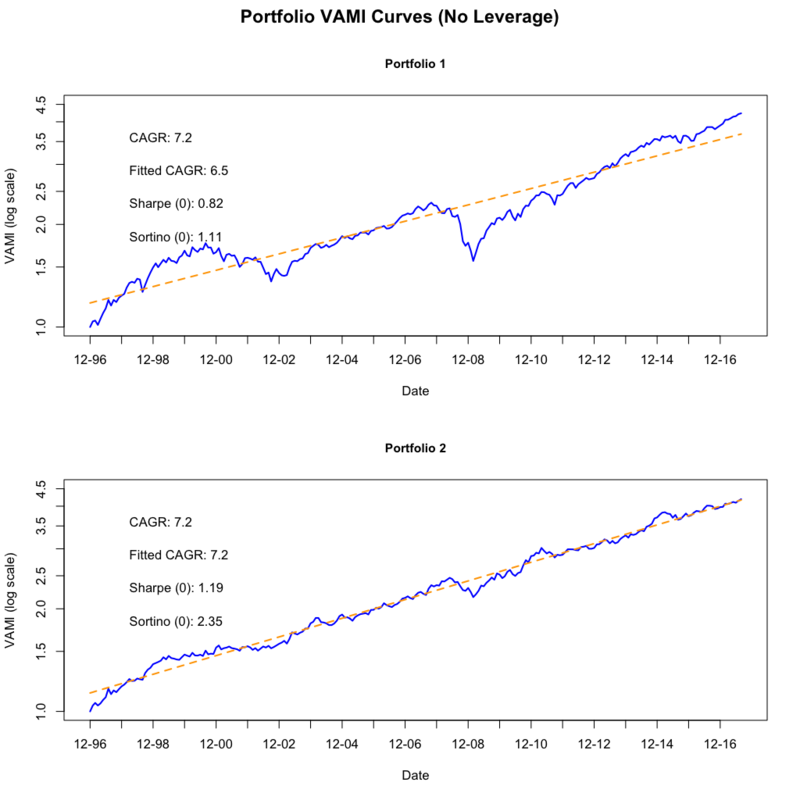 Hedge funds and managed futures smooth your equity curve reducing sequencing risk. If you are managing a pension plan, endowment, or foundation, you are in this for the long haul. On average, hedgies have under-performed for a couple of years, while the market has out-performed. That’s how diversification works! Another (contradictory) belief is that hedge funds are a high risk punt with a tiny allocation to “spice up” a portfolio of stocks and bonds. You may only have exposure to a single manager – there’s no diversification within your alternatives allocation. The diversification benefit to your overall portfolio will be minimal. 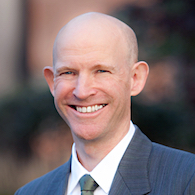 Costs in terms of fees, due diligence, and management most likely outweigh the benefits. We should take Master Yoda’s guidance: if you are going to allocate to hedge funds and CTAs, make it a meaningful allocation. 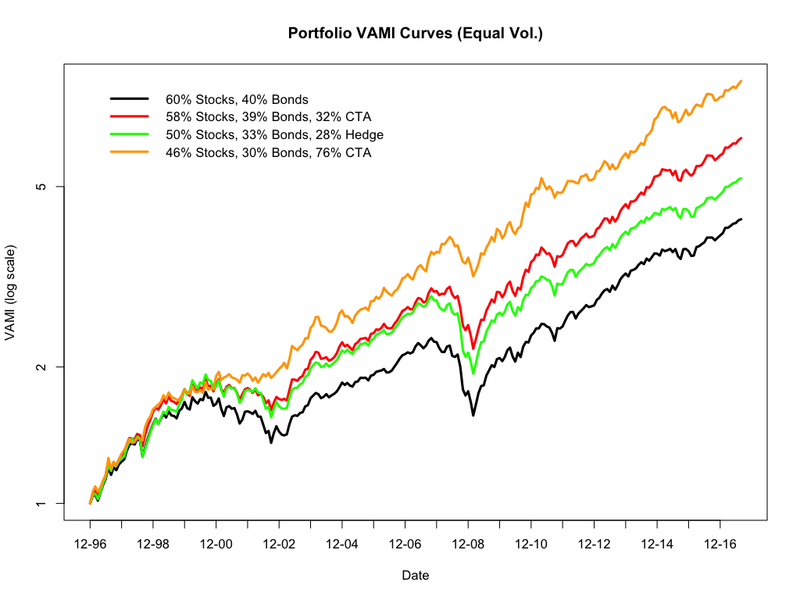 Introduce the 4 components (stocks, bonds, CTAs, and hedge funds) from which I will build various example portfolios. Examine 4 basic portfolios starting with the classic 60% stocks : 40% Bonds then adding in alternatives. Take the 4 basic portfolios and add leverage so we can compare them on a constant volatility basis. Finally, as a mind expanding exercise, I will take things to an extreme, so be ready! 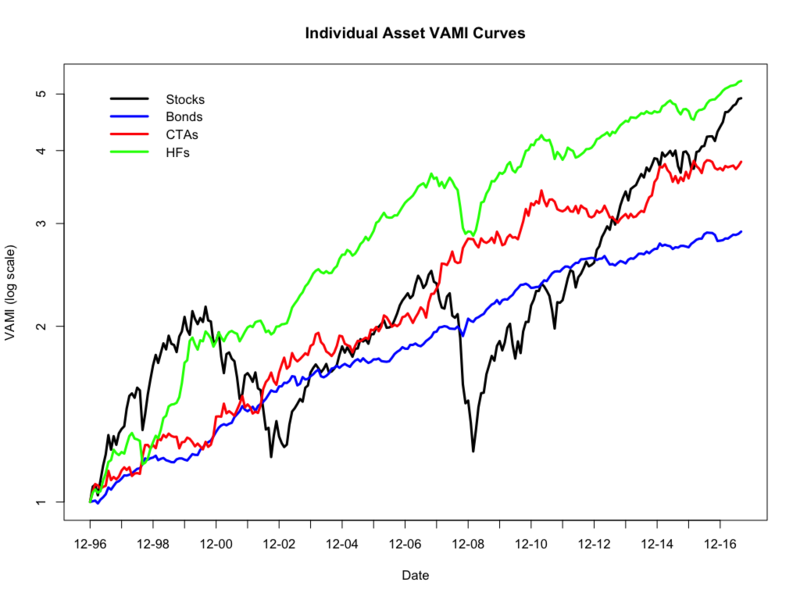 The Value Added Monthly Index (VAMI) curves are plotted on the chart below starting at January 1st, 1997 and running through August 31st, 2017 (20 years and 8 months). 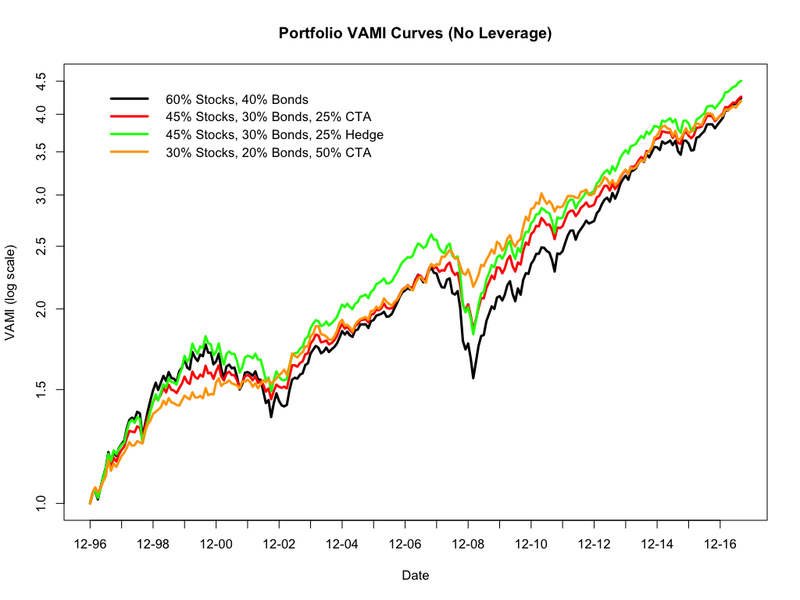 I use a logarithmic y-axis – read my hedge fund hack to learn why. 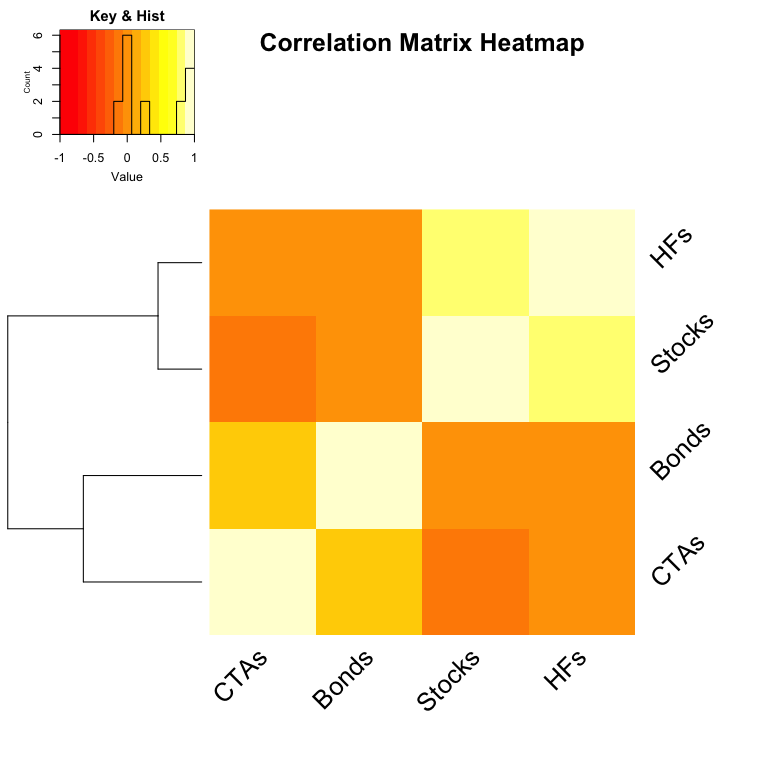 The adjacent correlation heatmap gives a good sense of inter-relationships between our portfolio components. A white square indicates a correlation of “1”, orange indicates “0”, red would indicate “-1”. The Key and Histogram top left shows how many squares are of each color. The dendrogram to the left of the heatmap is a cluster analysis based on the distance between the average of each row of correlation coefficients. Notice that the hedge fund index and the S&P 500 TR index are quite strongly correlated (the exact numbers are in the table), while CTAs and bonds have zero correlation to stocks, and hedge funds. 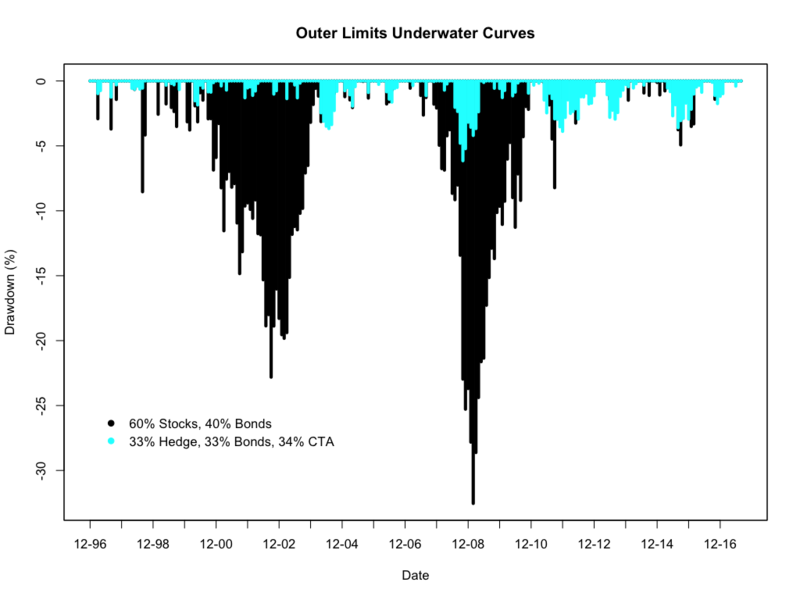 Bonds and CTAs are modestly correlated (most likely due to the fact margin money has historically been parked in a bond portfolio). How Bad is Hedge Fund & CTA Performance Really? Bonds have turned in a surprisingly solid performance BUT they have had the wind at their back – how much lower can rates go? CTAs lag in terms of absolute performance, but out-perform stocks on a risk-adjusted basis. Both CTAs and Hedge Funds have recently under-performed their long-run fitted compound annual growth rate. Stocks have recently out-performed their long-run fitted compound annual growth rate. Even though Hedge Funds have a strong correlation to equities, their skill is clear in their risk-control. The significance of the third and fourth items should be clear to anyone who read my CAGR hedge fund hack. A least squares fit to the VAMI gives a more reliable estimate of CAGR than simply dividing the last point by the first point and taking roots. The fifth item is especially interesting and could be interpreted as follows: owning hedge funds is like owning stocks with less risk. We will come back to this idea later. Owning hedge funds is like owning stocks with less risk. In the first exercise I set up a base case, the 60:40 portfolio, and explore the effect of adding a little hedge fund index and a little CTA index. Then I show what happens with a lot of CTA! 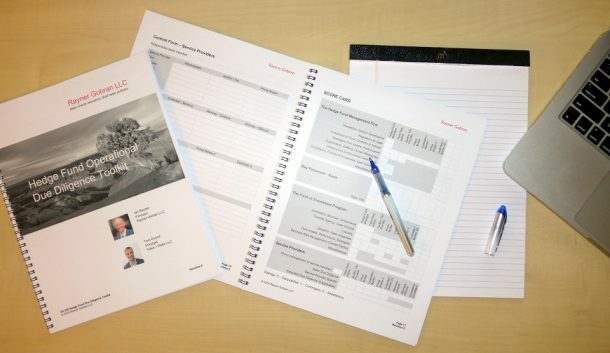 Base Case: Standard 60/40 Portfolio – The classic 60/40 portfolio. The basic concept is that the slow and steady returns of bonds off-set the wild ride of stocks. CTA Case: 45% Stocks, 30% Bonds, 25% CTAs – The ratio of stocks and bonds is still 60:40, but we have “diluted” the portfolio with a 25% allocation to CTAs. We are hoping to benefit from the lack of correlation between stocks and CTAs. HF Case: 45% Stocks, 30% Bonds, 25% Hedge Funds – This is the same as above but we have used hedge funds instead of CTAs. Aggressive Case: 30% Stocks, 20% Bonds, 50% CTAs – Capitalizing on the benefits of adding CTAs, we add still more. The ratio of stocks and bonds is still 60:40. 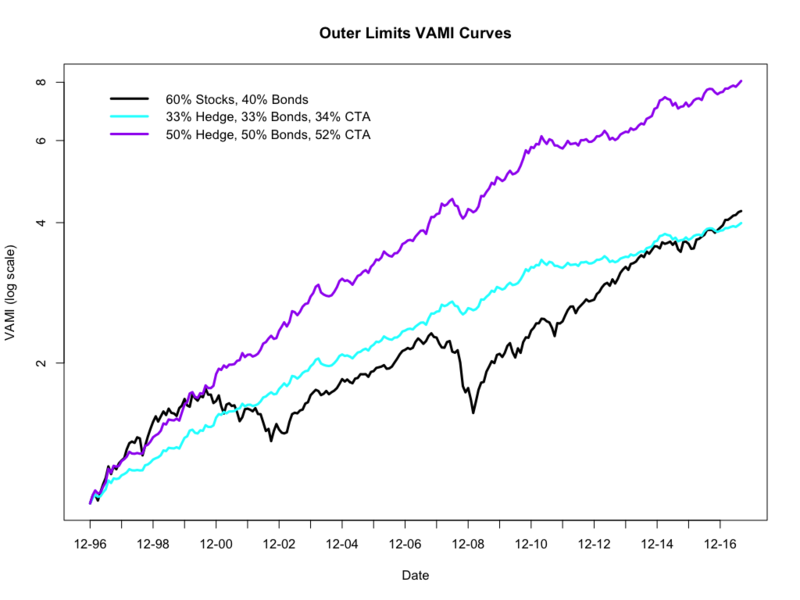 On the chart below all four VAMI curves are plotted on the same logarithmic axis. To see them plotted separately, MOUSE OVER THE CHART. On mobile, tap the chart. Switch back by tapping outside the chart. The next chart compares the underwater (drawdown) plots for the Base Case and the Aggressive Case. To see the underwater plots for all four portfolios separated out, MOUSE OVER THE CHART. On mobile, tap the chart. Switch back by tapping outside the chart. I don’t know about you, but those equity curves that include exposure to managed futures (CTAs) look much easier to ride than the Base Case. Look particularly at the draw-downs – to me this is a measure of risk that matters much more than Sharpe Ratio. The Hedge Funds portfolio is an improvement on the 60/40 portfolio, but not by a huge amount. This should not be surprising as Hedge Funds and equity indexes are quite strongly correlated. The benefit is coming from the small diversification benefit and the much improved risk control offered by skilled hedge fund managers. This re-affirms the idea mentioned earlier that owning hedge funds is like owning equities with good risk control. When hedgies are accused of being closet indexers, the critic is usually ignoring risk control. If two portfolios have different levels of volatility, all other things being equal we should adjust leverage so we can compare them on an equal volatility basis. In this case all other things are not equal, in fact they encourage leverage because drawdown performance of the unleveraged portfolios with alternatives are far superior to the Base Case 60/40 Stocks and Bonds portfolio. The dramatic improvement should be obvious. I am not suggesting you run out and lever up like this. After all, part of my point is that the ride in stocks over the long haul is too rough as it is, so why lever up a much smoother equity curve to achieve this level of turmoil? The goal is to find the boundaries of the range of possible allocations. Note: Depending on the vehicles you have access to, you may or may not be able to lever at all. So now I want to tell you a story. I was sitting at my computer showing the “Gobran” in “Rayner Gobran” the charts I was developing. She says to me, “Well, if hedge funds look like stocks with better risk control, and stocks and CTAs work well together, why don’t you put hedge funds with CTAs and forget about stocks?” So I did. What I like about this is it reminds me you have to think outside the box – it did not occur to me to consider a portfolio without stocks! I hope you are convinced that you should seriously consider a large diversified allocation to hedge funds and managed futures. To get there, reframe how you view hedge funds in general. Go beyond the single data point captured by compound annual returns. See past recent performance vs. equities and look to the long term. Alternatives are not turbo-chargers of returns. They are long-term diversifiers that provide a much smoother ride towards your investment targets. 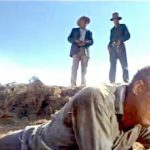 One final point: These portfolios are created from equal-weight indices which include the good, the bad, and the ugly. The allocations have not been optimized in any way – I just picked obvious round numbers. There is nothing clever going on here. At Rayner Gobran, we build model portfolios from the best of the hedge fund and managed futures worlds, selected for their complementary risk and return characteristics. Imagine how a sizable allocation to the right portfolio could benefit your core bond and equity investments. Don’t hesitate to reach out to us via our contact form, LinkedIn, or just call! 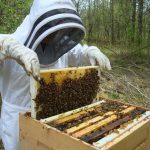 Ping me if you would like a pdf version of this article. I wanted to work with monthly data series. Some data is tabulated with months in columns and years in rows, so it is not clear which specific calendar date is implied. Other data is in the form of one long continuous daily or monthly time series. Different markets have different holidays. To simplify, I assigned each data point to the last calendar day of the month. Some data is in the form of a Value Added Monthly Index (VAMI), while some data is in the form of monthly or daily return. For consistency I converted all series to monthly returns. For ease of calculation and simplicity I effectively rebalanced each portfolio monthly. That is, the return of each portfolio each month is simply the weighted sum of the returns of each index. Depending upon serial correlation in the data series, rebalancing less frequently may improve performance or make it worse. This is an area of optimization all by itself! I leave it up to the reader to investigate. This data was sourced on 2017-10-26 from Yahoo Finance using the ticker “^SP500TR”. It is a measure of exposure to a broad index of US stocks with dividends re-invested. There are a variety of ways of accessing this index in real life, including low cost index funds, future contracts, total return swaps, etc. 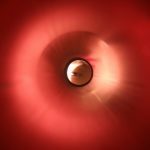 There are pros and cons of each, but it is outside the scope of this article to address them, and it would not affect the broader point. Here’s a good overview of the index, including access to detailed descriptions of its construction: S&P Dow Jones Indices S&P 500. This data was sourced from the Morningstar website: Morningstar: XIUSA000MC, using a combination of the performance table provided and reading data manually off the longer term chart. You can also use the Bloomberg ticker: LBUSTRUU:IND. The index was formerly known as the Lehman’s Aggregate Bond Index. The Bloomberg Barclays US Aggregate Bond Index is a broad-based flagship benchmark that measures the investment grade, US dollar-denominated, fixed-rate taxable bond market. The index includes Treasuries, government-related and corporate securities, MBS (agency fixed-rate and hybrid ARM pass-throughs), ABS and CMBS (agency and nonagency). Provided the necessary inclusion rules are met, US Aggregate-eligible securities also contribute to the multicurrency Global Aggregate Index and the US Universal Index, which includes high yield and emerging markets debt. The US Aggregate Index was created in 1986 with history backfilled to January 1, 1976. The BarclayHedge CTA Index is broad and goes back a long way, but is not available for download. The BTOP50 seems too narrow. The SG-CTA index only goes back to 2000. Having an index start right before a major stock index decline would seem like I was cherry-picking my start date. HFRXM was more or less identical to the CISDM index, but one year shorter. I ran a correlation analysis of CISDM CTA, SG-CTA, BTOP50, and HFRXM and found correlation coefficients in the 0.9+ range across the board. I am comfortable that I would have seen similar results using any of the indices. These indices were rejected on the basis of duration and/or very high correlation to stocks. Hedge Fund fees are under pressure again. There’s a drumbeat from institutional investors demanding lower fees in light of lackluster performance. So what’s a manager to do? We provide some analysis and negotiating strategies.